Charming, cozy, comfortable and private, the split level studio is available for short term holidays during summer months. 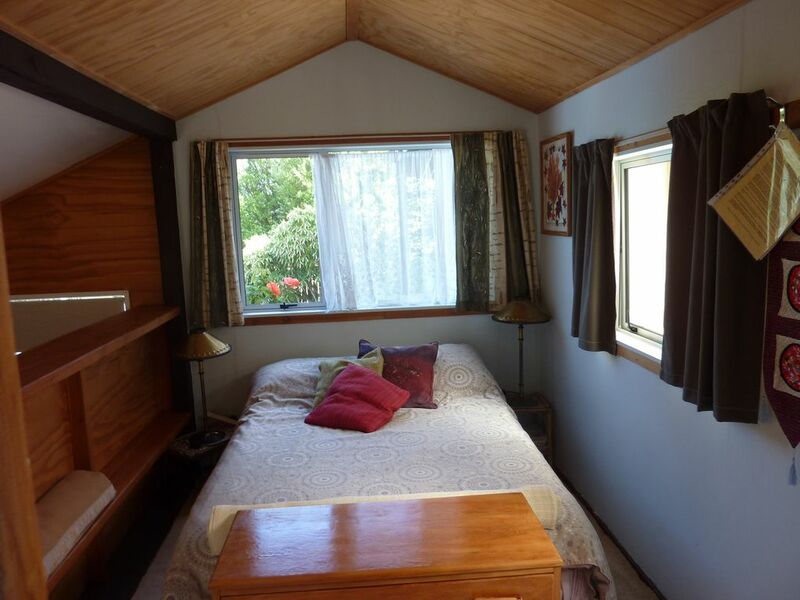 Cottage style, it is a compact little cabin with a new(ish) mattress for your comfort but generally with a feel of a retro kiwiana holiday bach. A great little place for relaxation, situated in a quiet location (cul-de-sac road) and only a 5 min. stroll from lake and beaches (Bremner Bay). The CBD is 2.5 km to drive or approx. 30 min. walk to the town center, depending on how many photo stops you have on the way. It is an ideal base for your self catered, independent action packed/ relaxation holidays. This independent little dwelling is situated on the same property as the Alpinism & Ski mountain and ski guiding company with the home and base of your hosts Iris and Gary. Split level, it contains a double bed, toilet/shower, heating, kitchen with fridge, stove, microwave, kettle, toaster, coffee machine, plunger, electric frying pan and all other essentials for a holiday cabin. The double bed suits a couple. Should you wish for two separate beds, a second bed (the sofa, as pictured, it is not a fold-out couch) can be arranged with bed linen set up, for a one off fee of $30. Please communicate about this, so that it will be ready, thank you. There is no baby gear in the studio. If you need any it has to be hired and organised. Bed linen and towels are provided. You can use the barbeque. We also have a wonderful sauna and garden bath which you are welcome to use, by prior arrangement - a special treat after any activity in our alpine paradise. Free wi-fi available (we have upgraded to unlimited but please note that it can be very limited and fluctuating lots), our internet connection is unstable at the best of times and really slow when Wanaka is full of visitors and the new "unlimited" has to be thoroughly tested yet. Free street parking and plenty of advice available about places to visit and things to do. Sticky Forest and other top quality mountain biking trails are only a couple of min. away. We have some hiking accessories which you may wish to borrow – it could be walking poles or an old day pack, a native plant or bird book, maps etc. Just ask and we ll see what we can do. Books are there to read and even exchange. Also, if you are into fishing, our smoker for the trout you catch is available too. Wanaka is small and has no public transport as such but taxis are available. If you book activities, there are often courtesy rides available. Upon arrival, parking is in front of the letter boxes. If you arrive by bus, communicate about a possible pick-up. If you need an iron and ironing board, please ask Iris, there is only one iron on the property and you are very welcome to use it. Same with first aid kits, they are in the main house, just ask. Check in and out are very flexible depending on reservations before and after your stay. Let us communicate about the details. Please note the location: we are not in the center of town, it is 2.4 km to the information center. looking forward to share our paradise with you. Iris is originally from Switzerland, though happily married in NZ for more than 20 years with a true mainland kiwi bloke. She has a background in tourism and hotel management and until recently was a trekking guide with a special interest in native flora and fauna. Husband Gary or Gaz is a mountain guide, also a very good handyman and often away. The combination of guiding and providing accommodation is a rather typical thing in the Swiss Alps and we fell naturally into this life style as well. It took us 5 minutes to decide that one day we'll live in Wanaka. The choice of the property was definitely based on the price. The old bach got transformed during the last 20 years into a very sustainable home with diversification to gas and solar. The location turned out to be perfect, not in the center but not too far away, close to lake and forest. We are nicely sheltered from the prevailing, strong NW winds as well. If you want 5* hotel service, this is not the place to choose, but if you want 5* customer service with a cosy and sparkly clean home away from home, try us. On the property are the main house, the base of the Alpinism & Ski guiding company and home of Iris and Gary. Then there is the studio which used to be a sleepout, a classic NZ one room dwelling outside the main house. We doubled the size and installed bathroom and kitchen. There is also a garden sauna (available) and a garage (not available). If you want a guided tour of native plants, you have a nice choice around the garden. It was Wanaka and its surrounding beauty that made us decide to get this property. The location has grown on us over the years and we wouldn't want to change it. From the studio you have mountain views only and you won't be able to see the lake but Iris & Gary have the privilege from the added on upstairs. wi-fi code inside studio, we are on an unlimited plan but please be aware that our internet/broadband can fluctuate a lot, depending how busy Wanaka is. Sorry but no wheelchair access. We have gravel and steps along the way. The studio is split level, meaning that there are steps to negotiate inside as well. You may smoke but only outside. Don't litter, ta! The Alpinism Studio is a 5 min. drive from the center of Wanaka. On foot, it is a 5 min. walk down to the lake, into town count 25-45 min. depending on how many photo stops you have, it is a most scenic walk. There are taxis available in Wanaka and if you book any activities, there are often courtesy vans available. If you are into hiking, plan a half day trip to Diamond lake Rock Crop loop track, one of the very best half day walks in the country - I read that somewhere and it's true, it's outstanding. Ask upon arrival for other tips. There is so much to do in Wanaka and surroundings, on land, water or in the air.